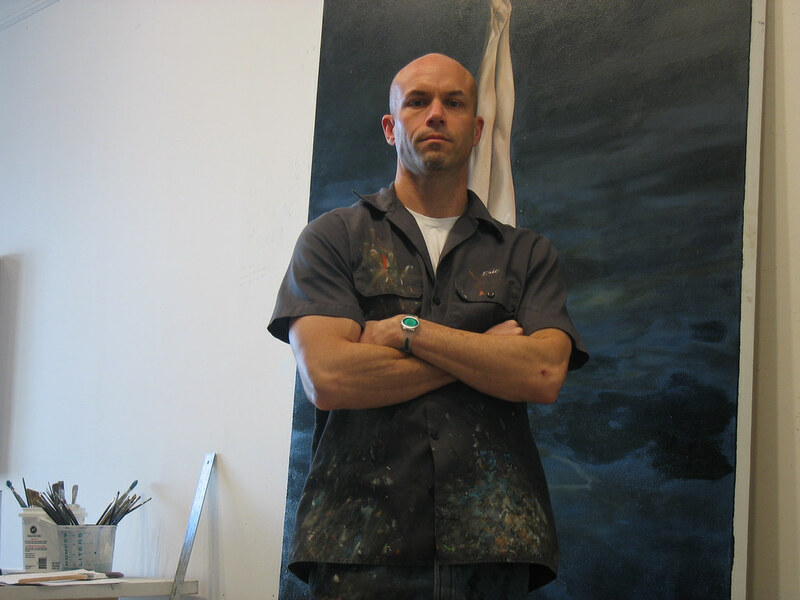 “I’m driving back to Eric Zener‘s studio in Saulsalito. Last time I was there he had me spray painting graffiti and tags on various gnarly surfaces. I thought it was really odd yet inspiring, a realist asking me to tag up his studio. When I asked what he was going to do with the graffitied boards and surfaces after I finished he said “I don’t know”…. I was stunned. I flashed back to laughing in high school and thus being called into the principals office and getting a weeks worth of detention for saying the same three words, “I don’t know”. The principal asked me what I wanted to do with my life after graduating and I simply recited the words I had just read in a book on Buddhism, “I don’t know”. “The “don’t know” mind frightens and offends those who are comforted by easy answers. Yet this is the genuine place where Zeners work evolves from. 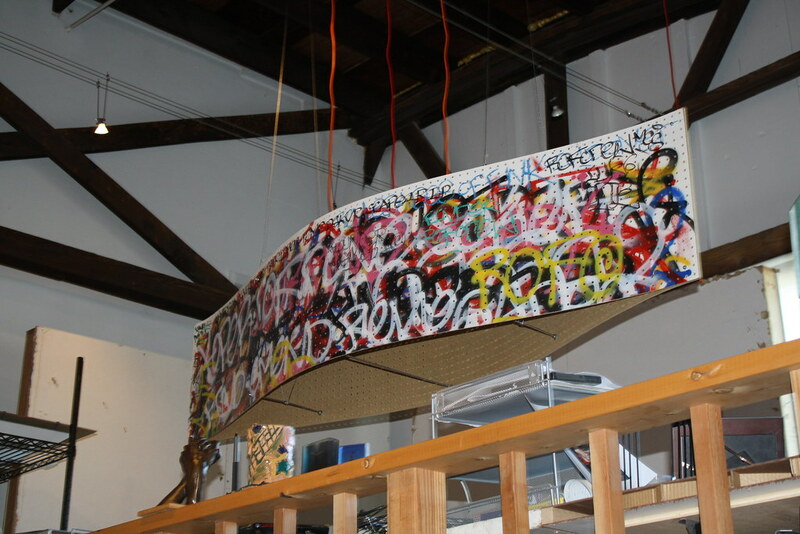 For the last 18 months, Zener has been locked in his studio, doing massive,inspired canvases. He has abandoned the world and universe that he previously created on canvas and zoomed in and focused on just a small yet intrinsic part of it. 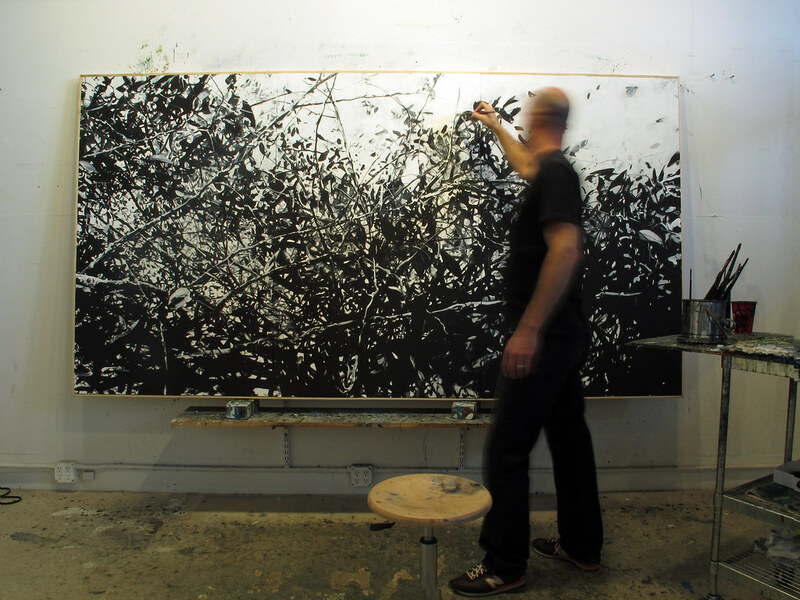 His studio is lined with huge imaginative black and white paintings of tree leaves. At first they look like abstract expressionism, but after a moment its clear that it is a perfectly rendered tapestry of leaves and branches, enveloping the viewer in a unique and powerful experience.” Dan Plasma interviews Zener below. Who were you when this journey began? I grew up in an artistic family. Art was soemthing I was comfortable with at a young age. I let it go for a while growing up and discovered it again as a young adult. After school ended I was at a low point. I felt lost, I had no career aspirations, no idea what to do with my life. For my own therapy, painting became a way to resurect the passion from my childhood, it became my escape from this mundane and uninspiring path I found myself on. I poured my energy into it, It became a great catharysis. In attempting to depict an idealized state, in struggling with and teaching myself the technical elements, there was a journey, a personal evolution and change. Your work is progressing, slowly, deeply, organically, is there a common thread? It’s a universal connection, water, sleep, nature, all encompass the same themes. It’s sort of a moment of a transformative state from one place to another, a discovery that comes from an immersion in nature….. hopefully in that brief ephemeral moment we can get some sort of baptism from our daily life. Over time the aesthetic and technical challenge of painting became my escape. Eventually the theme of the work evolved into escape and renewal. I poured all of my energy into art and it became its own catharsis. I suppose all poets, writers and artists have an element to their work which is examining or tapping into the pure, mind, the sub concious, for me its about depicting an idealized state…. I try to offer scenes which are a respite from the trappings of modern life, a cleansing. in some cases its literal, water is a cleansing, within it is a universal connection and through the actual physical return to this state of being immersed in water, the state we came from. The various themes are simply an emotional vehicle to achieve a type of psychological and spiritual connection. You live next to a huge dock. Traditional cultures speak of living next to water being a powerful spirtual element, why has it been such a prevelant element for your work? I’ve had both extremely good and extrememly bad experiences with water. Several near drowning experiences on the bad side. Nevertheless there is this strange duality where I am enamored by water, I need to be near it. I’m drawn to it but at the same time fearful of it. Where does the evolution and progress of your work come from thematically? I don’t want to push it, but I don’t want to resist it. Evolving as an artist should be something that comes naturally. I think the key is to not force it, but to notice when it taps you on the shoulder, or whispers silently in your ear asking you to notice something new, and to explore that part of you and trust that part of you to explore it. Your new work looks like expressionism at first but it’s actually realism, is this a new universe or just different places in the same world? All of the places that I paint provide the same transformative state. Sleep, water, nature, all direct us to the opportunity to achieve this feeling and see that way. Clearly this looks different than what I ususally do. Part of it is selfish. I wanted to break out of the accuracy and references of realism and anatomy. The cataharsis of breaking out of that process and doing something visceral and gestural without much attention to the truth of form, where honoring the feeling is most important, that’s where this comes from. It’s very basic and primitive mark making, purely, 100% selfishly it feels good, it’s good for me to push myself and try new things. How is the feeling of this exploration different from more technical work? The message and metaphor is the same for me. It’s just that the process itself is refreshing, not having to care so much if it’s correct creates a more direct and emotional connection between me, the work, and the viewer. In your past works, it’s easy to depart from reality and see the metaphors which you are creating, does your new work make more severe metaphors or is idealism still part of this universe? The ethic is the same. There are some components of the physical part of this new work needed to expand on the connection to nature. One is that nature is big, we get a sense of humility and decompression with nature, realizing how small we are. The physicality of the canvas is to immerse the viewer, the same way you are immersed in nature. This connection and embrace. The cascade of bubbles underwater is not that far away from the cascade of sleep, or light and leaves. The key to making it work is being alone.The profound sense of quiet that you get form being alone in nature allows you to listen, to connect. The chatter is gone when nature surrounds and envelopes you.